Image-Guided Neurosurgery provides readers with an update on the revolutionary improvements in imaging and visualization relating to neurosurgery. From the development of the pneumoencephalogram, to the operating microscope, to cross sectional imaging with CT and later MRI, to stereotaxy and neuronavigation, the ability to visualize the pathology and surrounding neural structures has been the driving factor leading surgical innovation and improved outcomes. The book provides a comprehensive reference on the application of contemporary imaging technologies used in neurosurgery. Specific techniques discussed include brain biopsies, brain tumor resection, deep brain stimulation, and more. 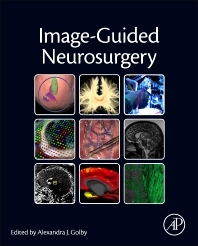 The book is ideal for neurosurgeons, interventional radiologists, neurologists, psychiatrists, and radiologists, as well as technical experts in imaging, image analysis, computer science, and biomedical engineering. Brain Biopsy v. Advanced Imaging: Why Do We Still Need Brain Biopsies in the Age of PET, MRS and Molecular Imaging?